Have you dyed your eggs or decided how to set the table for Easter yet? If not, here are some ideas that will give the day a unique look that wont take you forever. Who said you have to dye your eggs for Easter? Farm fresh eggs come in lovely shades of light browns, tans, and blues. Gold or silver leaf would look elegant or use a white paint pen like the picture below along with feathers for that boho vibe. You really don't have to work too hard at making a spring themed floral display. This display is simple and would be easy to add your own spin to it. 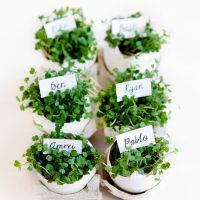 Here, all you need are a few small clear glasses or vases, some blooming stems, eggshells, and of course a little water. Easter morning is always exciting for the little ones. Grab their baskets and off they go to find the most candy filled eggs. Why not change it up a little this year? Apartment Therapy has 9 ideas that are sure to give the kids and you a good time. No matter how many people will be sitting at the table it is always fun to do it up right with name cards and beautiful food. 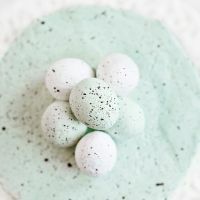 How about eggshell place cards and a cute dessert display.